Description: Come and dance for man’s best friend! 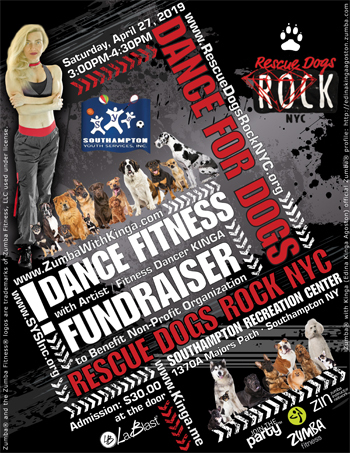 On Saturday, April 27, 2019 at 3:00PM artist/fitness dancer Kinga will teach a 1.5 hour dance fitness class for the benefit of Rescue Dogs Rock NYC, a nonprofit animal welfare organization. 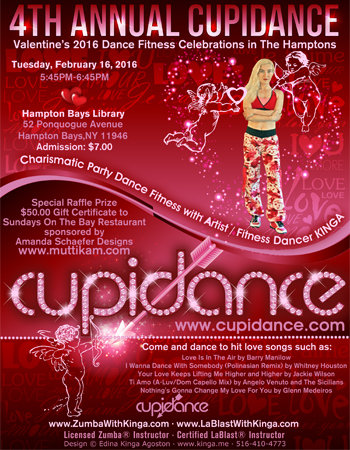 The fundraiser will be hosted by Southampton Youth Services, located at 1370A Majors Path in Southampton. Admission is $30.00 per person. 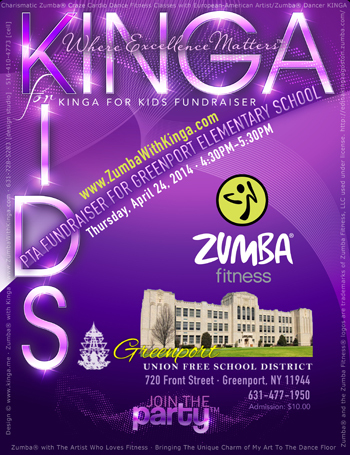 Sponsorship opportunities are available - please inquire at kinga@kinga.me or call 516-410-4773. Description: Dance Fitness with Kinga presenting routines from today's hottest dance fitness programs Zumba(R) and LaBlast(R) at Step Into Your Color Zone Wellness Show 2017 at the Wellness Center in Nesconset, Suffolk County, Long Island, New York. 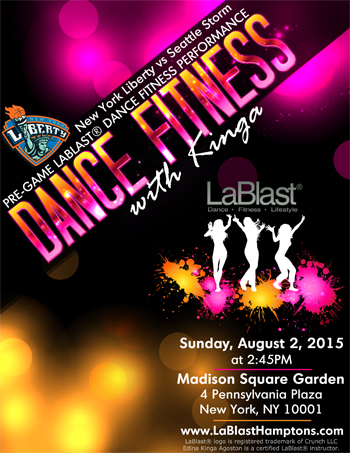 Description: Dance Fitness with Kinga is going back to Madison Square Garden to perform on July 10, 2016 at the New York Liberty vs San Antonio Stars women's basketball game! This year we are dancing Zumba(R).. There will be a special prize raffle drawing at the end of the class. Please dress comfortably, wear sneakers and bring water. Description: Come join European-American artist/fitness dancer KINGA for her charismatic dance fitness classes presenting today's hottest fitness programs, Zumba(R) and LaBlast(R) creating a calorie-incinerating cardio workout focused on weight loss and body toning disguised as a dance party. Look for Kinga at the AARP Long Island booth. Description: We finally made it to the major leagues! 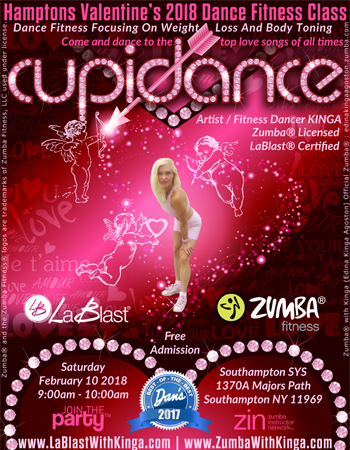 Description: Come join European-American artist/fitness dancer KINGA for her charismatic dance fitness class presenting today's hottest fitness programs, Zumba(R) and LaBlast(R) creating a calorie-incinerating cardio workout focused on weight loss and body toning disguised as a dance party. Description: Részletek jelenleg szervezés alatt. 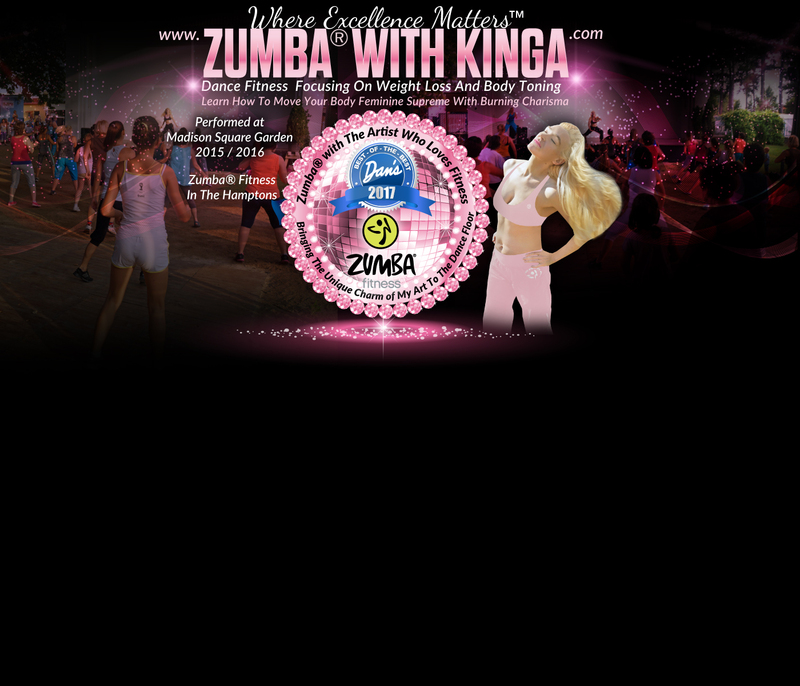 Ha szeretnél velem Zumba® órát/partit a következõ email címen érsz el: kinga@kinga.me. Be part of this noble cause while having a blasting workout! 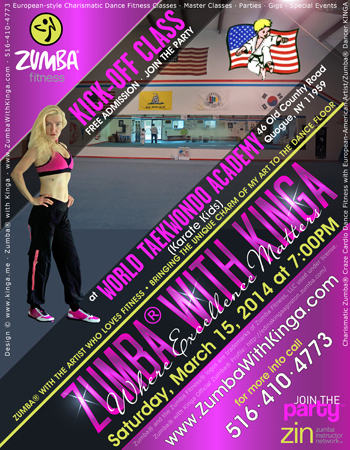 Come and join European-American artist/fitness dancer KINGA for her charismatic, calorie-burning, high-energy party dance fitness class focused on weight loss and body toning. Please dress comfortably, wear sneakers and bring water. Spread the good word and invite your family members, co-workers, friends, acquaintances in the community. All proceeds to benefit breast cancer support groups and charities. 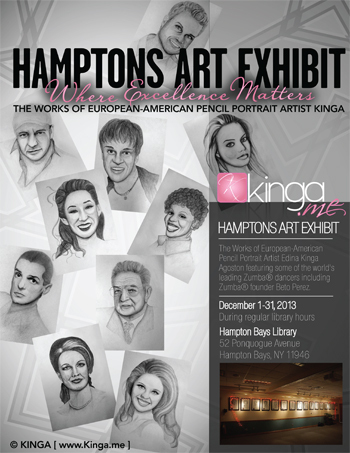 Pencil art by KINGA of Zumba® Founder Beto Perez will be on exhibit and for auction as part of the benefit proceeds. Description: Come on out and join European-American artist/fitness dancer Kinga for her charismatic, calorie-burning, high-energy party dance fitness class in the spirit of the summer focused on weight loss and body toning. Please dress comfortably, wear sneakers and bring water. Description: Be part of a noble cause helping children the same time have a blasting workout! 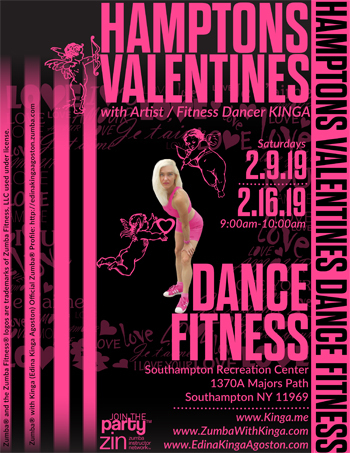 Come on out and join European-American artist/fitness dancer Kinga for her charismatic, calorie-burning, high-energy party dance fitness class focused on weight loss and body toning. Please dress comfortably, wear sneakers and bring water. Spread the good word and invite your family members, co-workers, friends, acquaintances in the community. Proceeds to benefit Greenport Elementary School. Description: Charismatic party dance fitness in the Hamptons Long Island New York with European-American artist/fitness dancer KINGA who is a licensed Zumba® instructor with focus on weight loss and body toning. 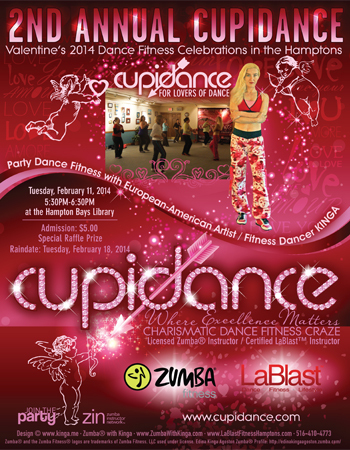 Description: Come celebrate Valentine's 2014 with the Cupidancers for the second year! 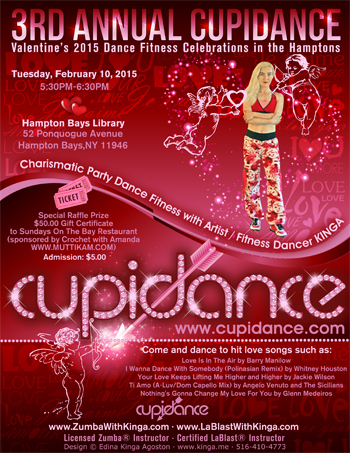 An hour charismatic dance fitness craze in the spirit of love focusing on weight loss and body toning. There will be a special prize raffle drawing at the end of the class. Please dress comfortably, wear sneakers and bring water. In case of inclement weather the rain date is Tuesday, February 18, 2014. 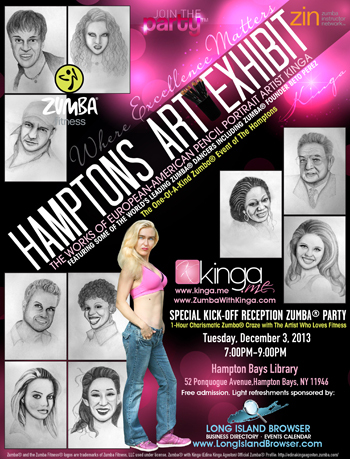 Description: Hamptons Art Exhibit: The Works of European-American Pencil Portrait Artist Edina Kinga Agoston featuring some of the world's leading Zumba® dancers including Zumba® founder Beto Perez. Description: Come and join European-American portrait artist/Zumba® dancer Kinga at her Art Exhibit Kick-off Zumba® Party - Charismatic Zumba® Craze Cardio Dance Fitness Routine. Kinga gives back to the community: Complimentary admission, refreshments served. All are welcome: Zumba® instructors, Zumba® lovers, Zumba® fans. 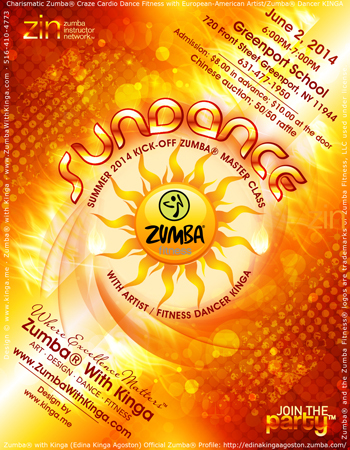 A unique, one-of-a-kind event: Zumba® with the artist who loves fitness. Description: Let the sparkles fly! 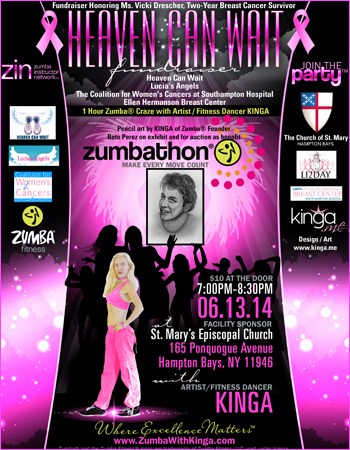 Come join European-American Artist/Zumba® Dancer KINGA for a charismatic Zumba® craze dance fitness gig at Glam-Me Girls Night Out of Long Island Networking Moms on Friday, November 22, 2013 at Heritage Center in Moint Sinai, NY. Description: Let the sparkles fly! 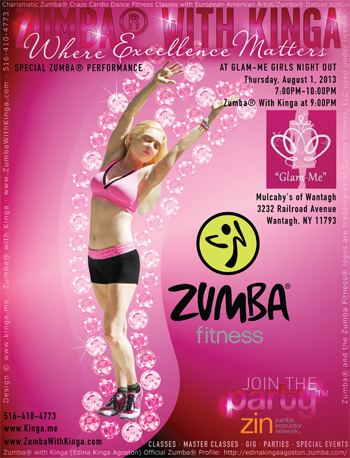 Come join European-American Artist/Zumba® Dancer KINGA for a charismatic Zumba® craze dance fitness gig at Glam-Me Girls Night Out with Long Island Networking Moms on Thursday, August 1, 2013 at Mulcahy's of Wantagh. Description: Let the sparkles fly! 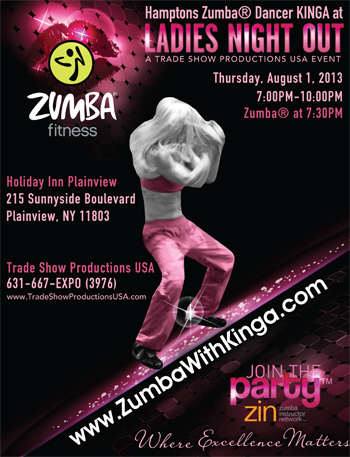 Come join European-American Artist/Zumba® Dancer KINGA for a charismatic Zumba® craze dance fitness gig at Ladies Night Out by Tradeshow Productions USA on Thursday, August 1, 2013 at 7:30PM at the Holiday Inn in Plainview, Long Island, New York. Description: Ladies and gentlemen, it's about that time again! Zumba® Master Class Time! 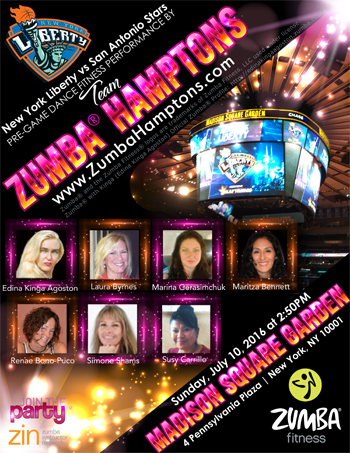 Come and join the heat with Long Island's hot Zumba® dancers Chrissy and Kinga! Grab your tropical colored tank tops and favorite fitting Zumba sneakers because we are taking this one outside. Join Long Island's Hot Zumba® Dancers Chrissy and Kinga on Saturday, June 1, 2013 at 8:00AM for a 90 minute movement explosion of non-stop Zumba® Fitness beats with a little Key West flare. H20 required, sunscreen optional. Description: Zumba® with Kinga Special Performance Dance Fitness Gig with European-American Artist/Zumba® Dancer KINGA at National Mom's Night Out presented by Long Island Press' Milieu Magazine for Long Island Women on Thursday, May 9, 2013 at the Broadway Mall, Hicksville, Long Island, New York. Description: Zumba® with Kinga Special Performance Dance Fitness Gig with European-American Artist/Zumba® Dancer KINGA at Ladies Night Out Trade Show by Trade Show Productions USA on Tuesday, March 12, 2013 at the Holiday Inn Plainview, Long Island, New York. 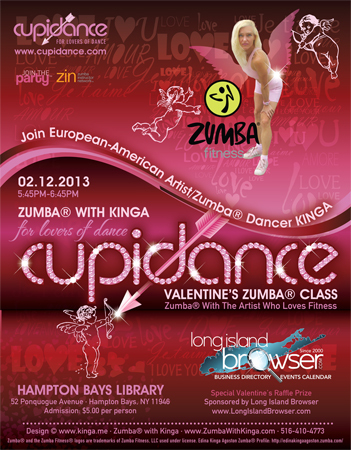 Description: Charismatic Zumba® Craze with European-American Artist/Zumba® Dancer KINGA and enter for a chance to win special Valentine's Day raffle prize sponsored by Long Island Browser [www.LongIslandBrower.com ]. Description: Zumba® with Kinga Special Performance Dance Fitness Gig with European-American Artist/Zumba® Dancer KINGA at Ladies Night Out Trade Show by Trade Show Productions USA on Thursday, November 29, 2012 at the Islandia Marriott Hotel in Islandia, Long Island, New York. 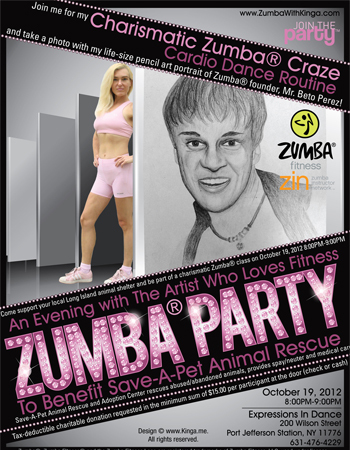 Description: Zumba® Party with European-American Artist/Zumba® Dancer KINGA to Benefit Save-A-Pet Animal Rescue and Adoption Center at the Expressions In Dance Studio in Port Jefferson Station, Long Island, New York.